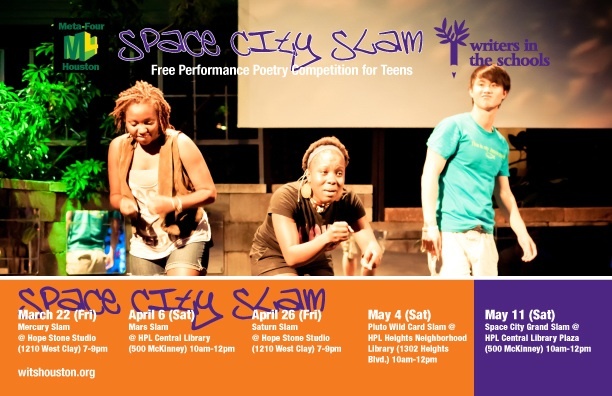 WITS » Last Chance to Slam! Calling all teen poets and writers! Join us for the Pluto Wild-card Slam. This Saturday is your last chance to make the Meta-Four Houston team that will represent Houston in the Brave New Voices International Festival in Chicago (August 2013). • All youth ages 13-19 are invited to compete. • The winners from this event and the first four slams will compete in the Grand Slam for the Houston team. Broadcast your words/your thoughts/your dreams through the Writers in the Schools (WITS) Meta-Four Houston performance poetry program.